When I started this blog a little over a year ago, one of the intents was to challenge myself to cook outside my comfort zone. You see, despite the fact that I’ve been noodling around in the kitchen for years, turning out meals that, more often than not, are pretty good and sometimes even better, I have a tendency to stick to dishes, ingredients, and modes of cooking that mostly fall within an established repertoire. That can get a little boring—for the chef, certainly, and probably also for those partaking of the meal—so if nothing else, I hoped the weekly exercise presented by this project would force me to cook a little more dangerously. And by and large I’d say that’s what’s happened. True, I haven’t tackled anything wildly ambitious—I haven’t made sausages from scratch, or French bread, or even a crockenbouche (yet)—but then choosing recipes purely for their “Wow!” factor was never the goal. Rather, I was simply aiming to create a degree of ease for myself around items that for whatever reason seemed to say to me, “don’t try this at home” (and hopefully in the process do the same for some of you as well). Of course, internalized warning labels such as these aren’t always logical, and as I’ve ventured further afield I’ve often found myself repeating that old lyric from Peggy Lee: “Is that all there is?” That was certainly the case with this week’s recipe for risotto—a dish that wasn’t half as challenging as I remembered it being (I think I last made risotto a decade ago, which is weird because I really like risotto), though it did prove a little tricky in the photography department, as risotto tends to start looking like oatmeal if it sits too long (see final image, below)! In any case, the recipe comes from a newly released cookbook, Harvest to Heat, a collection assembled by Darryl Estrine and Kelly Kochendorfer, with all of the dishes sourced from various farm-to-table oriented chefs around the country. 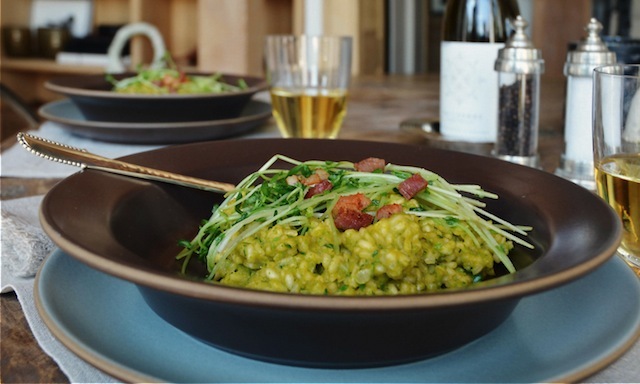 This particular risotto recipe (featuring fresh fresh peas and pancetta) was provided by Doug Keane, of the Michelin-starred northern California restaurant Cyrus, and immediately spoke to me. And it did this not just for the reason listed above, but also because the imagined flavors of the fresh peas and pea shoots called for by the recipe were so vivid in my mind that I simply had to bring them to reality. Who knows, maybe all those fresh peas I’ve been seeing around had worked their way into my brain, making me particularly vulnerable to their charms. The vegetable, of course, is at its most plentiful during the spring so you’re likely to find an abundance of them at both the farmer’s market and your local supermarket, as I did. More of a concern to me, however, were the pea shoots, an item I’d never cooked with before and wasn’t sure I’d be able to locate. I needn’t have worried. While the green has been largely off my radar, it nonetheless seems to have become commonplace in many produce departments, and I found ample supplies everywhere from the greenmarket to my neighborhood Whole Foods. And while I’m tempted to say you can always substitute watercress here (which pea shoots resemble in some superficial ways, namely those small leaves and edible stems) the flavor of the shoots is much sweeter and pea-like (and also a little bean sprout-y), and I think would ultimately be missed here. That pea flavor is the hallmark of this dish. 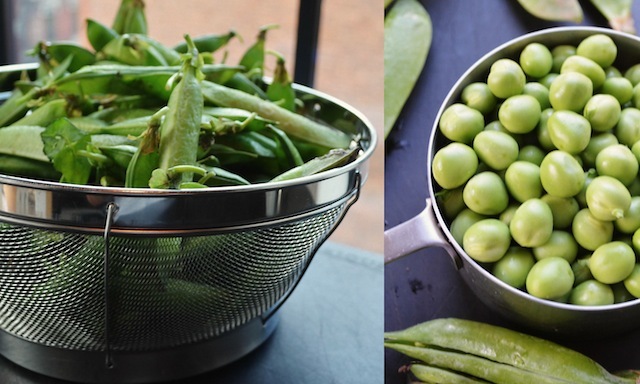 In fact, one of the things I like most about this recipe is that the shelled peas are only cooked for a minute—just long enough to bring out their signature sweetness, though not enough to render them mushy or even particularly soft. Still, they’re pliant enough at this point to be pureed (in either a blender or a food processor), which is exactly what you’re meant to do once they’ve had a chance to drain and cool—a process I gave about a half hour. And following this the pureed mixture is then pressed through a fine-mesh strainer, with the goal of separating out any solids. Here I met a minor speed bump, as no matter how forcefully I pushed the puree against the sides of the strainer, nothing came through. So after several attempts I elected to live with whatever tiny pieces of skin the food processor’s blade had failed to reach—a decision that made no discernable impact in the final tasting as far as I could tell. And another minor point regarding the recipe: rather than moving on to the making of the rice at this point as the recipe suggests, I advise jumping ahead to the preparation of the two items that will be scattered across the finished dish—namely the diced pancetta (or bacon), and those aforementioned peas shoots. 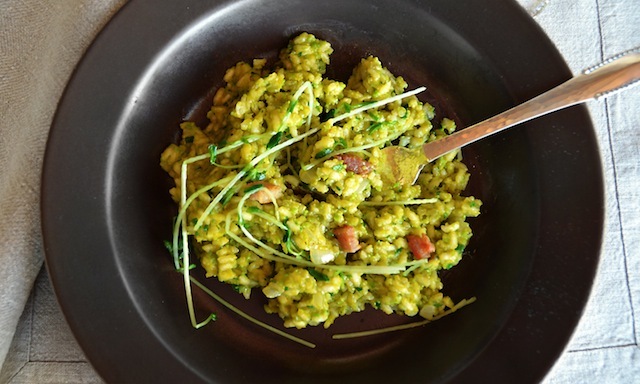 The reason for this is simple—the nature of risotto making is such that it doesn’t allow for any simultaneous activities, nor do you want it to sit for any length of time while the rest of the ingredients are readied. So rather than jumping in to the critical rice stage, I first cooked the bacon on the stove top at medium-high heat until crispy (about 8 minutes or so), then gave the pea shoots a quick sauté in the same pan (wiped clean of the excess bacon grease, and moistened with some additional butter)—a process that takes little more than a minute. 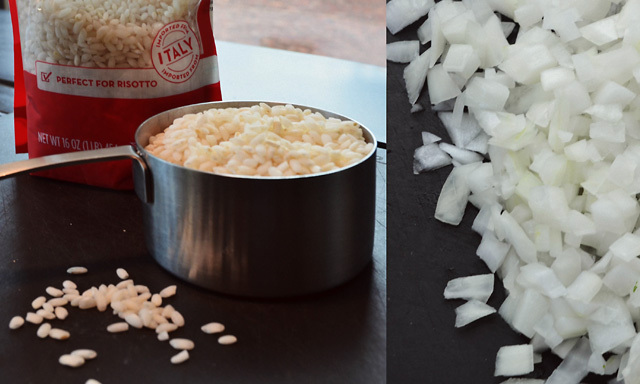 With both of these items prepared and set aside, you’re now in good shape to focus on the main event: the risotto, itself. Despite my anxiety about making risotto, it’s actually quite easy. What’s challenging about it, though, (and the reason for my overblown reluctance to take it on) is that it requires undivided attention on the part of the cook—attention that comes in the form of constant stirring (for roughly 35 minutes), and the incremental addition of liquid the moment the rice begins to look dry. Given all this, before beginning the rice you’ll want to make sure you have all of the ingredients prepped and ready to go. So the vegetable broth should be brought to a simmer, the white wine should be measured and standing at the ready, and the various items needed for the flavoring base (in this case, the onion, the garlic, and the herb bouquet) should be chopped and assembled. Once all these items are in place it’s time to tackle what in many ways is the most rewarding phase of this recipe, since along with all the wonderful fragrances that emerge from the pot—the butter and onions, the herbs and white wine—you also have the reward of watching the rice transform from a dry little grain into something that’s plump and bursting with the flavors of the ingredients it’s cooked beside. Like so many good things, though, it’s a process that can’t be rushed. So whether it’s the wine, which is added to the rice and onion/garlic mixture all at once, or the broth, which is added incrementally as each of the four cups is absorbed, it’s important to give the various liquid stages plenty of time with the rice—roughly 15 minutes for the wine, and five minutes for each of the broth additions. To that end you want to make sure that the stove is hot enough to allow the liquid to cook the rice, but not so hot that it’s simply evaporating out of the pot. I mention this because on my stove the recipe’s suggested settings—medium-high for the wine stage, medium for the broth—proved too hot, and I found the liquid disappearing sooner than it should have. The danger, of course, is that if I hadn’t lowered the temperature, at the end of the cooking process I would have found all the liquid gone but the rice still not fully cooked through. Calibrate things correctly, though, and what you’ll end up with is rice that’s tender to the bite but still offers a touch of resistance—in other words, nothing mushy. Instead, in this semi-broken down state the rice is marked by a creamy consistency, making it a willing partner for whatever ingredients are to follow. Here that means a quantity of butter, some additional herbs, a bit of salt and pepper (which it needs), and most important of all, that pea puree. After several good stirs, this final addition turns the entire mixture a glorious shade of green. Topped with the bacon and the sautéed pea shoots and you have something as vivid as it is delicious—a mingling of the sweet (those peas and pea shoots) and the salty (the bacon), all of it framed by the subtle acidity of the wine. The only thing missing is a generous dusting of grated Parmesan cheese (my addition, not the recipe’s) to make this dish really sing: the flavors of spring nestled in a soup bowl. —Bring a small saucepan of water to a boil. 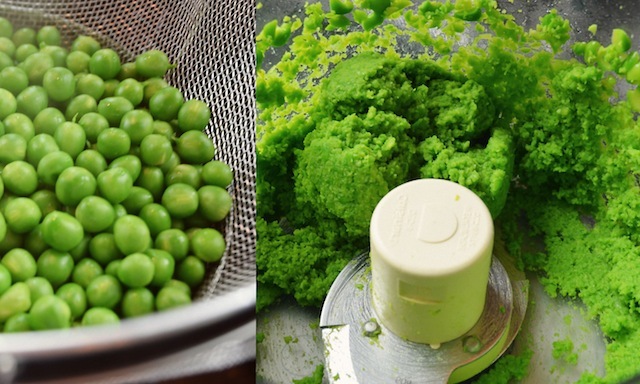 Add the peas and cook for 1 minute. Drain and cool. Transfer to a food processor or blender and puree; strain through a fine-mesh strainer and discard any solids. Set aside. 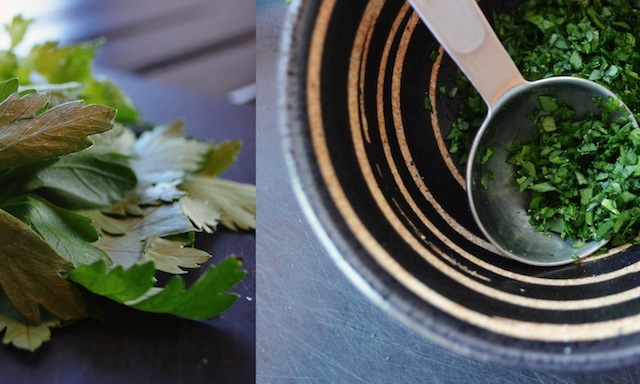 —Wrap the whole parsley sprigs, thyme, bay leaves, peppercorns, and fennel seeds tightly in cheesecloth and tie with butcher’s twine. —Heat the broth in a medium saucepan over medium heat to a simmer. 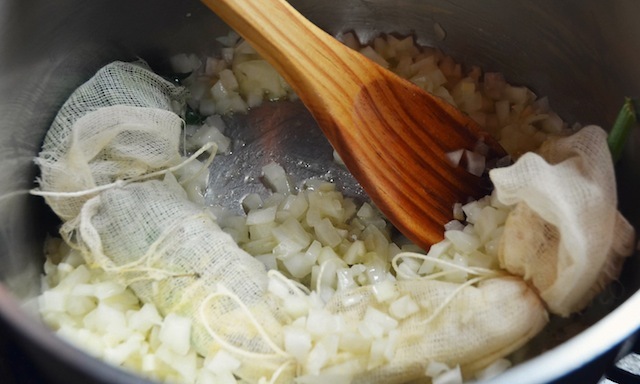 Melt 4 tablespoons of the butter in a large saucepan over medium heat; add the bouquet of herbs, the onions, and garlic. Cook until the onions and garlic are softened, about 5 minutes. Add the rice and stir to coat evenly with the onion mixture. Add the wine, increase the heat to medium high, and cook, stirring constantly, until the wine is completely absorbed, about 15 minutes. 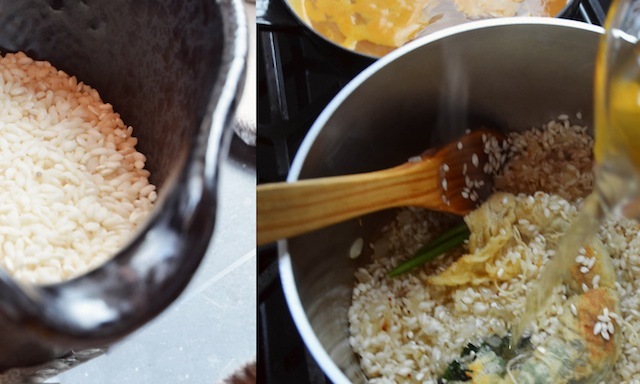 Reduce the heat to medium, then add the warm broth 1 cup at a time, stirring the rice constantly until most of the liquid is absorbed before adding additional broth. Continue to add broth, stirring until the rice is almost cooked through, about 20 minutes. 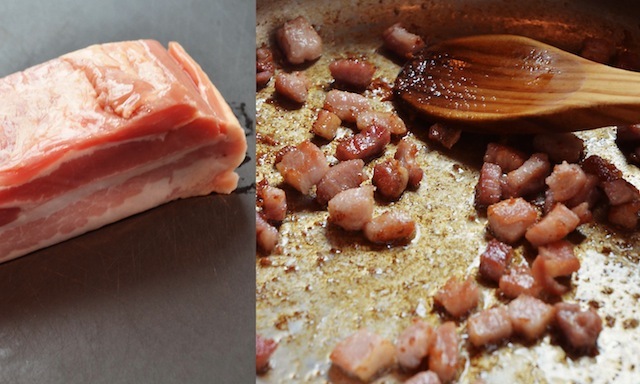 —Meanwhile, in a medium skillet over medium-high heat, cook the pancetta or bacon until crisp, 5 to 8 minutes. Drain on a paper towel-lined plate, then transfer to a small bowl and set aside. Wipe out the skillet and heat 1 tablespoon butter over medium heat; add the pea shoots and cook until just wilted, about 1 minute. Set aside. 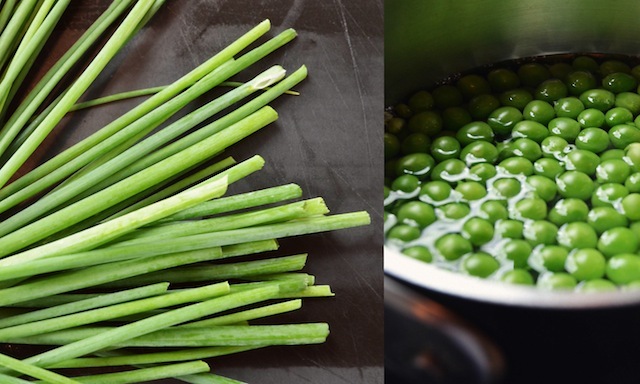 —When the rice is just cooked through, remove the bouquet of herbs, then add the remaining 3 tablespoons butter, the pea puree, chopped parsley, and chives. Season with salt and pepper to taste. —To serve, ladle the risotto into soup bowls. Top each serving with the crisp pancetta or bacon and the pea shoots. This looks amazing! I am making it for my family right now. I love risotto and I am so excited to try this.